Offering cuddles, fun, endless love and no back-chat, a four-legged companion is our kind of significant other. With Valentine’s fast approaching, we round up a host of sweet buys to reward your dog’s affection. 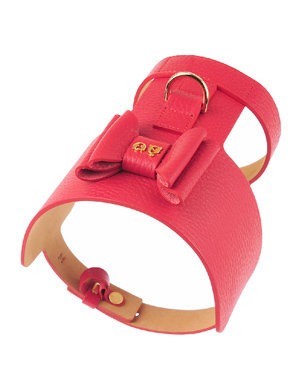 As seen on Lady Gaga’s ‘Little Monster’ Miss Asia Kinney, this stunning caged leather harness in love-heart red is super light and luxuriously soft. Adjustable at the neck and chest with gold buckles, the harness’ finishing touch is a cute leather bow, which personally gift-wraps your special furry package! 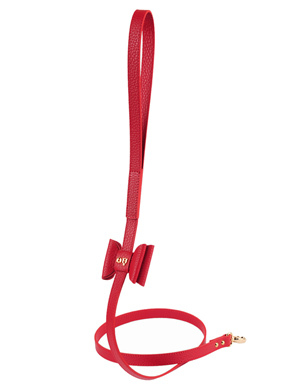 Like you and your dog, the Bisou lead and Bijou harness are a perfect partnership. With a leather bow strategically positioned close to the handle, you’ll feel as cute as your pup with this Valentine’s gift idea. If your pooch is planning to smooch with their furry beloved, keep their breath smelling fresh with these odour-busting natural treats. 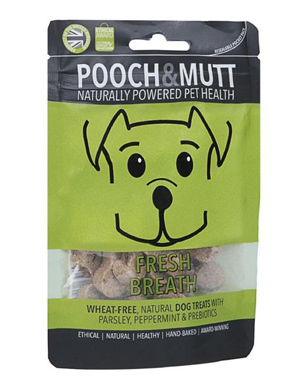 Mini bone shaped and chicken flavoured, these baked biscuits include Parsley – a source of chlorophyll (a natural deodoriser), Peppermint for breathy-freshness, and Chicory, which is a natural prebiotic to aid the functioning of the digestive system. Hound and human gifts don’t get any more adorable than this pet ID tag and keyring combo. 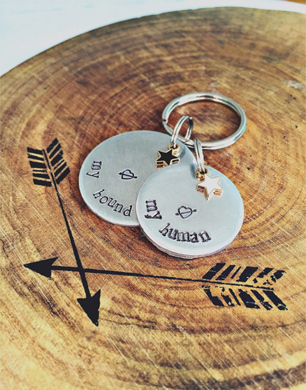 Handmade, hand-stamped, one item reads ‘Love My Hound’, the other ‘Love My Human’, both designs feature cupid’s arrow. A Valentine’s gift for both of you to treasure. 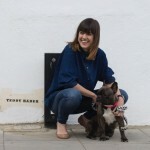 Whether your dog’s got a date with you or their barking beau, Hownd’s doggy version of Chanel No. 5 will freshen them up a treat. Scented with rose, lemongrass and orange essential oils, and blended with good stuff such as Argan oil, this spray will leave your dog smelling sweet and their coat gleaming with nourishment and shine. 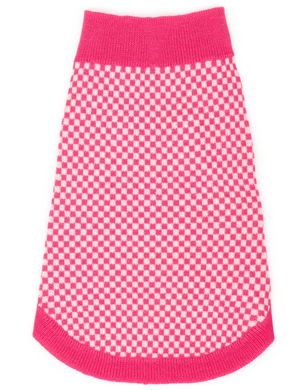 Spoil your pup with pink to make the boys wink with this pretty checked, cashmere doggy sweater. Gorgeously soft, your dog will feel your love with every wear. Crafted from 100% lightweight cashmere this style will carry your style pup through to Spring. We’ve fallen for this stylish charm collar, which promises a special buy for girl and boy pups alike. Choose from a selection of five Swarovski charms or enjoy a surprise courtesy of Lead The Walk. Once gifted, add or switch your dog’s charm collection with every special occasion. 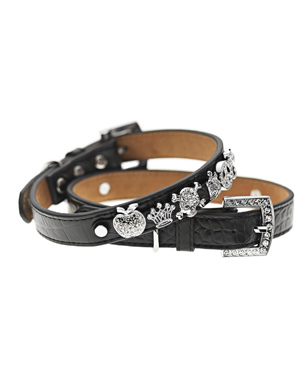 If your kind of Valentine’s gift ends with an ‘O’ – think ValentinO, then this Rockstud inspired doggy collar is on point for your fashion hound’s February gift. 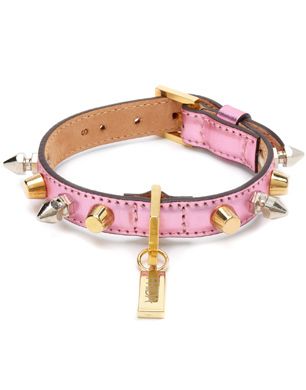 Handmade in soft metallic pink leather, this luxe collar is adorned with a row of silver and gold studs, and chunky gold tag. 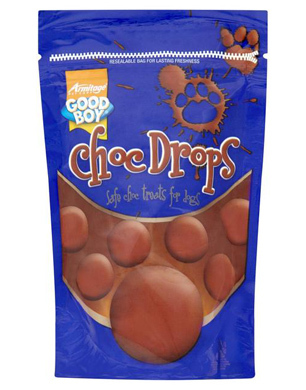 Nothing says I Love You quite like a treat, and for a steal of a price these choccie drops of tastiness will take aim at their heart. Formulated especially for dogs (remember human chocolate is very dangerous for dogs), these love drops contain added vitamins for goodness.